I spent Saturday night eating delicious food, smoking sheesha, and playing with words with some of my writer tribe, and it was so good. I’ve been so focused on specific projects and RESULTS lately that I’ve forgotten how to… you know. Play with words. So that’s what I did all of Saturday night, and it was glorious. “So which one of us gets this restaurant?” she said. “If we do,” she corrected herself. But we both knew it was too late, and tears danced in the corners of her eyes as my mouth curved down then up. “Everything is temporary,” I said. Making her feel better or worse? It was, after all her slip. She poked at her food. Then looked at me. “You get the restaurant,” I said. It didn’t cheer her up. We lasted three more weeks… and six more restaurants. There was another one she liked better. I let her have it. And I kept this one. So, what is this piece? Nothing and everything. It’s writing practice. 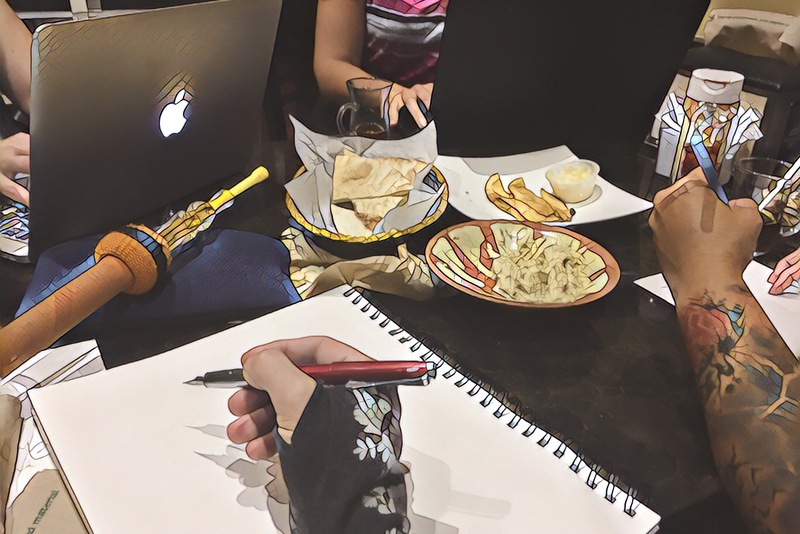 It’s 200 words written in a breath–in this particular case, I suggested that we “sprint” until the restaurant’s host brought our sheesha and snacks–to a timer. Without break or pause. It’s the equivalent of a musician’s scales, an artist’s sketches, an athlete’s work-out session in the gym. Parts of it might end up in a future work. Maybe. I rather like the idea of that question–“So which one of us gets this restaurant?”–being the beginning of an end of a relationship. Don’t you? Or, it might never go anywhere. It doesn’t have to. Its sole purpose is… that I wrote it. It’s my writing stretch. My skill building. I’ve been crazy, crazy busy this summer working on several projects, specifically, planning the Audio Book Blog Tour of Consequences! 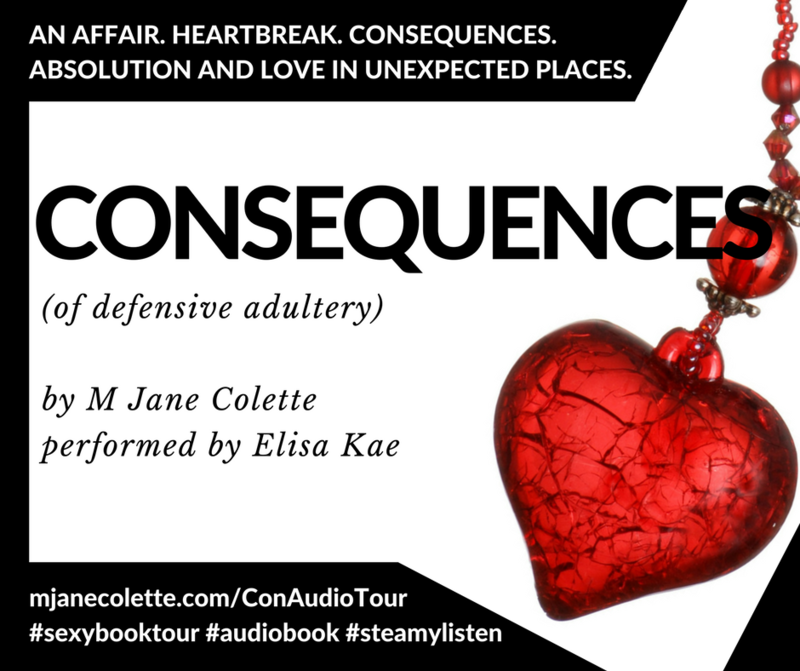 I’ve got details galore and the full schedule about it here: Consequences Audio Tour–and we start in… two weeks! Two weeks! BTW, the audiobook doesn’t release until late November/early December, so this whole tour offers you the opportunity to LISTEN to Consequences for FREE weeks and weeks before it’s available for sale. 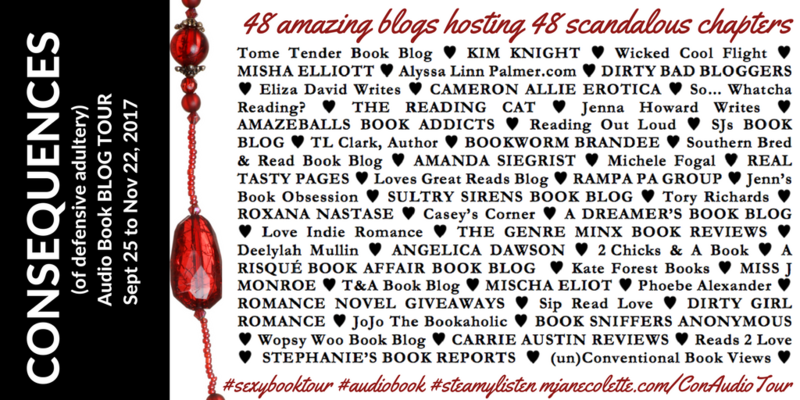 So mark your calendars–we begin on September 25–and get ready to tour around some fantastic blogs with me. While we’re getting ready, I’d like to introduce you to my fabulous hosts. There are 48 of them (Consequences has 48 chapters, and each blog is hosting one FULL audio chapter), so we’re going to break this up over a few days! And that’s all for today, kittens.